This year kicked off with a bang for EVE Online as rumblings emerged of impending war on a scale that the gaming world had never seen before. It looked as if two massive military coalitions were about to come to blows in the most spectacular way when a small border skirmish between The Imperium and Pandemic Horde escalated out of control. Both sides armed heavily for a battle over a space station and moved hundreds of expensive Titans and Supercarriers into position to prepare for the battle. Players estimated that a fully escalated battle could have seen the equivalent of a million dollars in ships go up in smoke, and the story of EVE‘s first “million dollar battle” rapidly captured the media. While that battle earned a Guinness World Record for having 6,142 players simultaneously in the same battle, it was far less destructive than anticipated. The Imperium decided not to commit its full forces and ultimately less than 1% of the expected value in ships went up in smoke. Fast-forward to this week and the old rivalry came to a head again as The Imperium teamed up Legacy coalition to launch an all-out assault on a Northern Coalition and Pandemic Legion staging Keepstar in the X47L-Q system — except that this time both sides committed their full forces. The result was one of the most destructive battles in EVE Online‘s decade-and-a-half long history, and this war may be just getting started. In this edition of EVE Evolved, I dig into some of the history that led to the current conflict and details of the battle in X47L-Q. The battle in X47L-Q has its roots in a much older and drawn-out conflict, with the rivalries involved going back for years and the strategic threads that led to the fight being rooted in much older conflicts. The two sides clashed in the famous 2016 war that came to be known as World War Bee or The Casino War, when a loose coalition of alliances bankrolled by mega-wealthy gambling kingpin Lenny Kravitz2 came together to wipe The Imperium off the map. Though that war ended with The Imperium losing all of its territories, the group stuck together and vowed revenge. With the banning of gambling websites in EVE soon thereafter, the streams of trillions of ISK used to create the Moneybadger coalition vanished and the threat of unassailable wealth generation lifted. The Imperium established a new home in the Delve region and began farming the space intensely to rebuilt its war chest, mining trillions of ISK per month in minerals and pumping it into supercapital shipyards to build titans. It wasn’t long before The Imperium was back at full strength, and in 2017 the coalition launched a major offensive campaign into the north of EVE by moving a thousand dreadnought class capital ships and fleets of sub-capital ships to a staging location in the Hakonen system. It looked as if the revenge the group had promised was firmly at hand, but 2017’s “revenge war” ended almost as quickly as it began. Moving a thousand dreadnoughts across the map overnight was a huge show of logistical force, but the ships were never used en-masse and the “dread-bombing” strategy may have proven ineffective against an enemy fielding large numbers of supercapitals anyway. 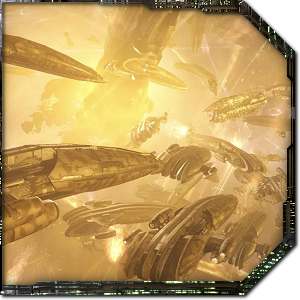 The Imperium left its supercapital fleets home in Delve for defense, and was initially unable to even successfully deploy and defend a single station in the north to use as a beach-head in enemy territory. This war never blew up to the scale and financial scope of the recent battle in X47L-Q, but was very interesting from a strategic point of view. I discussed the strategy and narrative behind the revenge war at the time back in 2017, noting that The Imperium claimed its goal was just to force Pandemic Legion and Northern Coalition to abandon their offensive deployments elsewhere and return home to defend. That worked almost instantly, and in the year that followed a pattern seemed to emerge in The Imperium’s behaviour: They would deploy offensively to disrupt enemy operations, but would always maintain their own mining efforts and shipyards at home. This was an arms race, and The Imperium wanted to win. What conditions lead to the fight? By the time January’s “million dollar battle” rolled around, both sides had managed to put together such enormous fleets of expensive supercapital ships that there were trillions of ISK on the field, but ultimately the ships weren’t destroyed. Everyone involved has been preparing for a massive supercapital slugfest with all cards on the table for months now, but every conflict that could escalate that high always ends with one side standing down. Battles in EVE Online tend to escalate to peak force only if both sides think they have the upper hand, so the conditions for this kind of battle emerging organically are pretty rare. The keepstar battle in X47L-Q seems to have had all the right conditions. Both sides in the conflict had roughly evenly matched numbers of supercapitals, both thought they could come out on top, and there was no cynosural field jammer to stop either side from jumping capitals into the system. The defenders were motivated to take the fight as it was their home staging Keepstar and the presence of the station gives a strong tactical advantage, while the attacking Imperium and Legacy forces just wanted to deal as much damage as possible and weren’t as concerned with the strategic objective. The Imperium had spent years building a massive brick of a fleet, and all they wanted to do was smash the north’s face in with it. 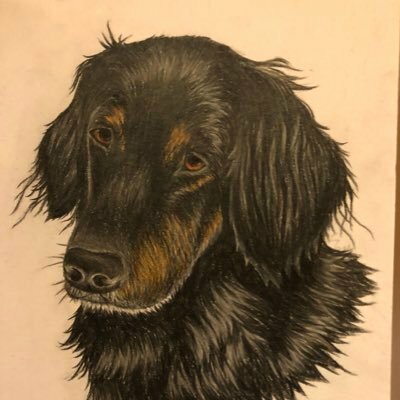 What exactly happened in X47L-Q? Imperium and Legacy ships began piling into the X47L-Q system around 19:00 on August 1st and moved into position near the target Keepstar station, while Northern Coalition, Pandemic Horde and allied forces formed up on the station to defend. 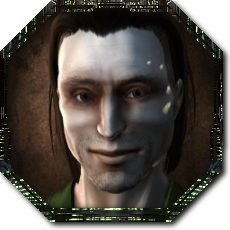 The defenders would have had to stop the attackers from dealing damage to the Keepstar for 15 minutes in order to defend it successfully, which realistically meant killing all of the Imperium titans on the field. 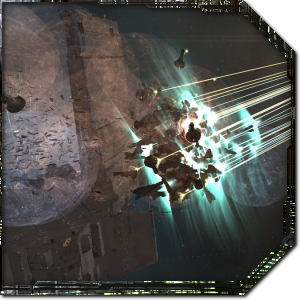 Both sides began co-ordinating their titans to focus their doomsday weapons at the same enemy titan one at a time to one-shot them off the field, and the battle devolved into the biggest supercapital slugfest in EVE‘s history. 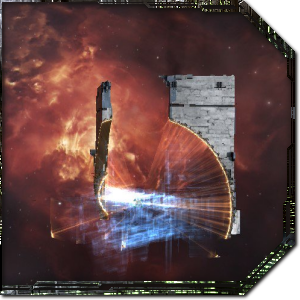 Fights of this kind just don’t normally happen in EVE, so we got see some bizarre new strategies such as supercarrier fleets being used almost as disposable tacklers to stop enemy titans from tethering to the nearby station and becoming invulnerable. 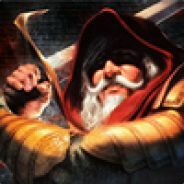 The server coped with the strain of the thousands of players involved in the battle by initiating Time Dilation to slow the game down by a factor of ten, but players still reported server stability issues and disconnections. The Imperium won the strategic objective early in the battle by keeping damage on the station for the required time, but then stayed on the field for some time to kill as many titans as they could. Northern forces had the same goal in mind, and gave The Imperium a bloody nose of its own for the trouble. New Eden Reports and INN News reported that a total of over 540 titans (each worth around 70-100 billion ISK) and over 510 supercarriers (worth around 20-30 billion ISK each) were deployed on the grid, which would have a combined value of between 48 and 69 trillion ISK. Though these assets weren’t bought with cash and were built in-game over the course of months of farming, 69 trillion ISK would be enough to buy around 23 million PLEX, which would cost up to $1,043,364 US if you wanted to buy it for cash right now. CCP reported that 56 titans were destroyed, along with 21 supercarriers, 406 dreadnoughts, 21 carriers, and 307 force auxiliaries. Automated battle reports from the groups involved peg the total damage on both sides at around 10 trillion ISK, which would buy around 3,333,333 PLEX worth up to $151,212 US. The 10 trillion figure makes this battle smaller than 2014’s famous Bloodbath of B-R that saw 11 trillion ISK in assets destroyed at a value of over $300,000 US using PLEX prices at the time, though the number of supercapitals involved in this recent battle is completely off the scale. This battle could have gone as high as over 50 trillion ISK in damage if both sides had remained on the field in full force, but the fight ending before total loss by attrition means that both sides have the assets for further battles. 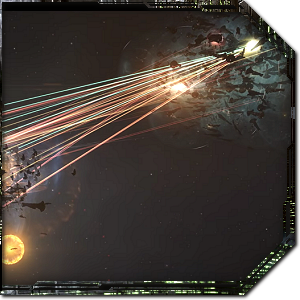 This could be the beginning of EVE‘s biggest ever supercapital war. Check out Steven Messner’s great piece on it over at PC Gamer for more information on the battle, and Lee Yancy over at Kotaku has a fantastic piece on the recent fight at UALX-3 that helped lead to the battle at X47L-Q and about some of the politics and motivations involved. I also suggest watching the INN Talking in Stations recording about the war for a fascinating first-hand account from those involved and insight into the strategy and tactics used. 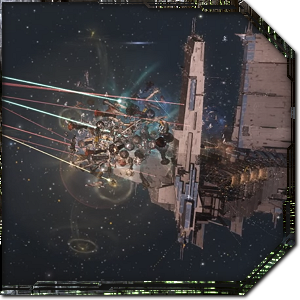 This massive battle was the first time in EVE‘s history that so many supercapital ships were committed to a fight and both sides initially went all-in, and we can only hope it’s a hint of things to come. There will be one final battle over the station in X47L-Q that is practically guaranteed to end with its destruction, and this could be just the first salvo in The Imperium’s promised war of revenge against the north of EVE. The first great supercapital war has truly begun in EVE Online. 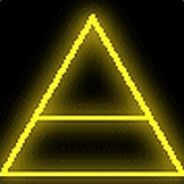 Reading about EVE is sooo much more interesting than playing it, it’s almost absurd! Still my favorite game…to read about. During your coverage of World War Bee, I likened you to the old World War II radio reporters such as Walter Winchell. 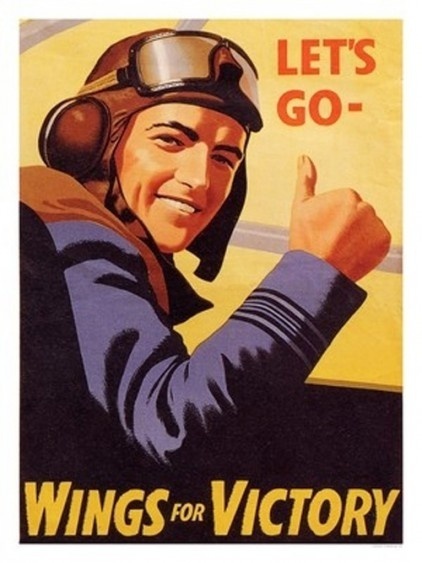 Not long afterwards, I found a vintage WWII graphic which seemed applicable for you. Now would probably be an appropriate time to send it along.